The SmartSump™ crawl space drainage system is specially designed for crawl spaces. 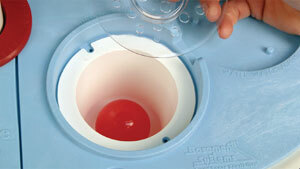 It has a lower profile than other pump packages, making installation in tight quarters easier. At its heart, however, is the same high-quality 1/3hp Zoeller pump used in many of Basement Systems other pump packages. Innovative Features: Why it’s so Smart. The SmartSumps' unique, airtight two-piece lid allows for easy access to the pump as well as preventing any collected water from evaporating back into the crawl space. In addition, any debris is prevented from falling into the sump pump pit and clogging the pump or switch. Built into this lid is a recess for a water-sensitive alarm. 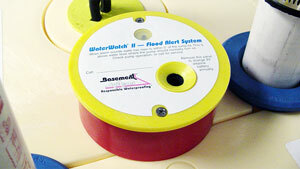 The WaterWatch® alarm, a patented device from Basement Systems, will alert you if water is present on top of the sump pump’s lid. 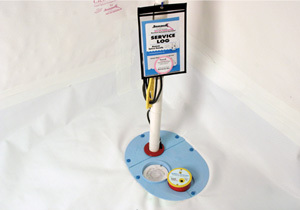 This alarm can save the day from an indoor plumbing leak that normally would go undetected. In crawlspaces slated for encapsulation, the lid integrates with the CleanSpace® vapor barrier for an airtight seal and no bunching of the liner. This is important because in the event of an indoor plumbing leak, bunching deters water from reaching the drain and causes standing puddles in the crawl space. Basement Systems’ airtight floor drain allows water to drain into the sump basin but while preventing damp air and soil gases from rising through the drain into the crawl space. How? A specially designed cup and ball underneath the floor drain allows water to go down, but doesn’t allow air to come up. For added protection, your SmartSump™ may be equipped with an UltraSump® Battery Back-up pumping system. 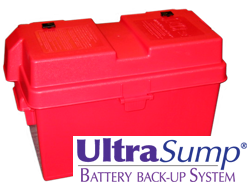 The UltraSump® is a second pump that takes over should the primary pump fail or if there is a power outage. 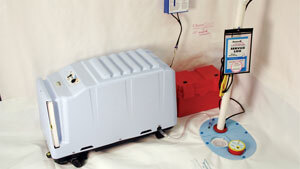 The UltraSump® can pump more than 8,000 gallons of water before it needs to be recharged. For a free crawl space consultation about the CleanSpace® encapsulation system, contact us today. Many crawl spaces are damp, requiring encapsulation, but are not subject to water infiltration and do require a sump pump and basin. In such situations, Basement Systems recommend its SmartDrain® Plumbing Leak System. It includes a basin and lid (with alarm and one-way drain) but no pump or plumbing. 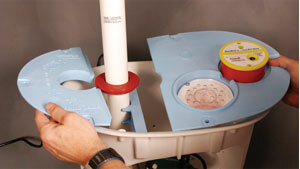 If there should ever be a leak, water sets off the alarm and drains into the basin liner. The liner, which has holes in its sides and is set in gravel, drains water into the soil under your home until you can repair the plumbing leak.